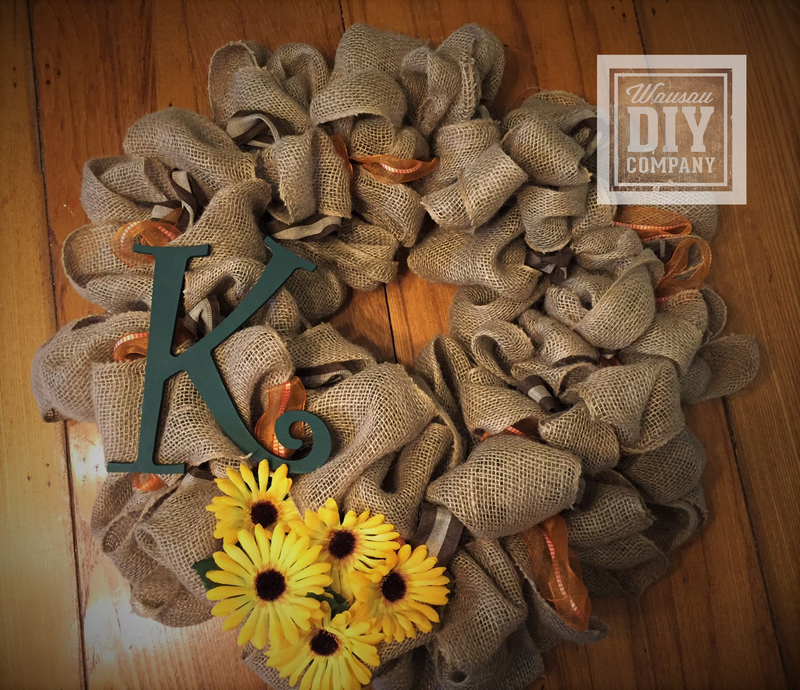 Fall is upon us and we can’t think of a better way to decorate your front door (well maybe with a DIY sign from one of our upcoming workshops) than with a burlap wreath. Burlap is all over Pinterest for fall! This is an easy project you can complete in an hour or so. Check us out on WSAW at 5:00 pm on Wednesday September 21st for a demonstration of how simple it is to create. 2 rolls of coordinating accent ribbon (minimum of 18 feet per roll) – we used two 12 feet roll per color for our wreath. Start with the burlap ribbon and flip your wreath to the back. Weave the ribbon through the wire frame and tie the burlap in a tight knot. Leave a short tail of ribbon. Begin weaving the burlap ribbon through the wire frame. Flip the wire frame around so the top faces you now and the knot you just made is in the back. Gather a small amount of burlap ribbon, like 6-7 inches, into a loop (bubble) and push it up between two of the wires in the frame. Next, take another 6-7 inches of burlap ribbon, create a loop and twist it once to change the direction. You’ll then push the loop between two of the other wires in the wreath frame so it’s not right next to the first one you pushed through. Add the first accent ribbon. As you did in step one with the burlap ribbon, tie the end of one of your accent ribbons to the wire frame so the knot is on the back side of the wreath frame. Now create a loop using 6-7″ of accent ribbon and push it up between two of the wires in the wreath frame that you haven’t used yet. Press the accent ribbon as closely as you can to your burlap loops. Start weaving loops of burlap and add your 2nd accent ribbon. 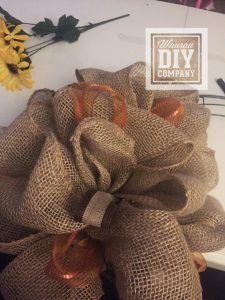 Create your third loop of burlap ribbon, twist it to change directions and push it up from the back side through two wires in the frame you haven’t used in a while. Repeat this process for your fourth loop of burlap ribbon, remembering to twist the loop to change directions and choosing to push it through two different wires than you just used for the previous loop. As the seam as adding your first accent ribbon, tie your second accent ribbon to the wire frame so the knot is on the back side of the wreath. Create a loop of accent ribbon and press it up through two different wires than you just used for the burlap loops. 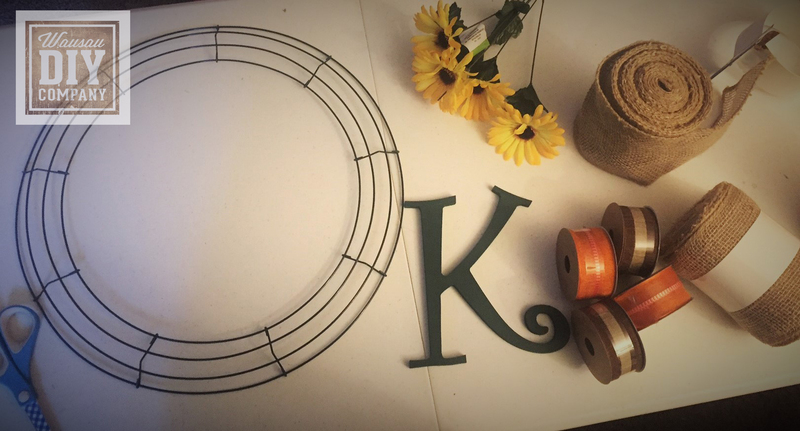 Continue the process of weaving loops through the wire wreath frame. Following the pattern of two burlap loops, then one loop of the first accent ribbon, two more burlap loops and then one loop of the second accent ribbon. Repeat this process over and over again as you make your way around the wire wreath frame. Continue to twist the ribbon each time before you push it up between the wires so the loops change direction. 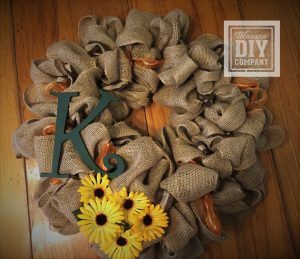 To maintain the fullness of the DIY Burlap Wreath, press the loops together after every 3-5 loops. We used 15 feet of burlap ribbon per quarter of the 16″ wire frame to get the fullness you see in the pictures. When one of your spools runs out of burlap ribbon, tie the end of the next spool to the previous one and hide the knot to the back of the wreath. After a while, the back of the wreath doesn’t look very pretty, but it doesn’t matter since no one sees that side anyway! Tie the last knot and fluff your burlap wreath. Once you’ve worked your way all the way around the entire wire wreath frame, tie the last end of the burlap ribbon and the two accent ribbons to the wire frame so the knots again are to the back of the wreath. Now fluff and rearrange your loops until it appears as full and colorful as you’d like. Remember the ribbon loops are only woven in and out of the wire frame, so be extra careful not to pull any of the loops out of the frame as you fluff. 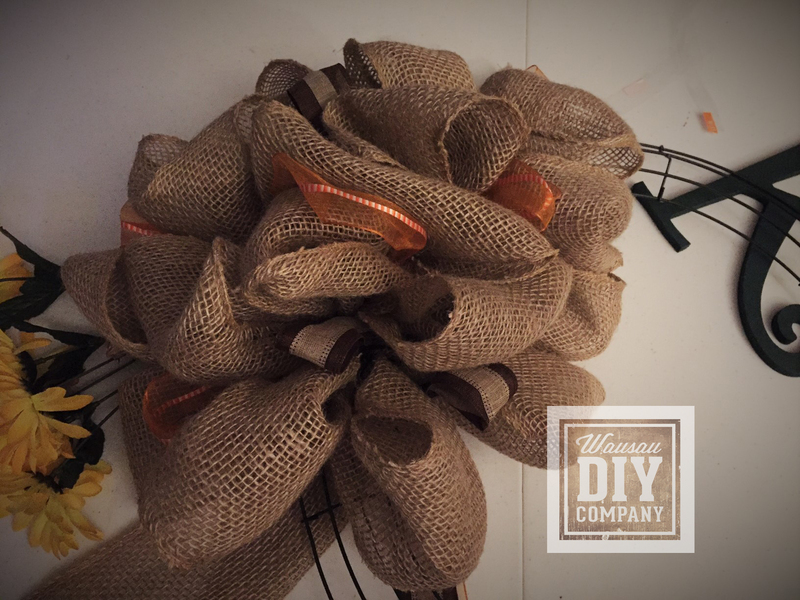 Embellish your burlap wreath. Use hot glue to add flowers or other accents to your wreath to give it more character. For flowers, use wire cutters to remove the stems from artificial flowers. Now put a large dollop of hot glue on the back of the flower. Carefully place the flower where you want it on the wreath. Use your fingers to pinch the burlap ribbon around the back of the flower so it adheres to the glue. Repeat with any additional flowers and then allow the glue to dry. If using a wooden initial for embellishment, paint and prepare your wooden initial. Paint your initial with the craft paint color of your choice. We used acrylic craft paint and a paint brush but you could use spray paint. Your initial will need two coats of paint. Allow the paint to dry thoroughly between coats. Apply hot glue to back of your wooden initial. Press securely to burlap and allow the glue to dry. Tie a piece of twine to the wire wreath frame and hang your completed wreath! You can use a wreath hanger or a large nail.